Here's a new Spectra tank, the version with venting. It only had that first short brass tube, the rest has to be built. Also, it does not come with clips for the longer brass tube. I think the outlet should be farther forward, like in the middle. The brass tube I had left was a bit short. Excellent, Blab. Best picture I've seen. And the copper vent is always a stub only; everyone has to finish the proper vent himself. This is the answer to the OP's concern about gas fumes, not the filler tube. Ford only added this detail on 27 March, 1964 in midyear production. Before that, cars had no vent on the tanks. Manufacturers still make OEM style tanks without the vent available for purists I guess, but I would never get one. I think the people who have written about gas expansion and spillage on this board have pre-March '64 tanks, and are noticing issues particularly in hot weather. That's one more thing. Vented, your gas cap never has that suction-vacuum thing going on in the summer. Silicone is an interesting idea; certainly can’t hurt anything. You’re using a new reproduction tank and it looks like an existing OEM filler tube. Is the tank a Spectra, specifically? Is it some other brand? Id like to know about the existence of a copper vent, if any, on the top of the new tank. I have never experienced lost fuel on hard corners, and I do take them comparatively hard given the confidence I place (maybe not so wise?) in a heavy duty front anti-sway bay I installed and a fully rebuilt front end I replaced with performance parts not used on the assembly line. Fumes have never been the problem either. But, since belonging to this board, I have read a few threads from some who have experienced both fumes and/or spills going around corners, mostly after filling their tank. I have more trouble filling gas without spilling due to the silly almost lateral design of the tube, but honestly, these Birds are not a bad design if vented correctly and capped correctly. Yes, I'm using a Spectra with OEM filler tube. And yes, Spectra only commercialize the unit with the vent now. I saw the other posts about how to go about it. Thanks for sharing your driving experience! that adds up quite a lot. I also read about the other post where someone was experiencing fumes/spills on a full tank. To me that really looks just like a terrible design. I don't believe the o-ring will do the job and neither silicone on gas is appropriate. I will call Spectra and take my concern to them and see what they say. 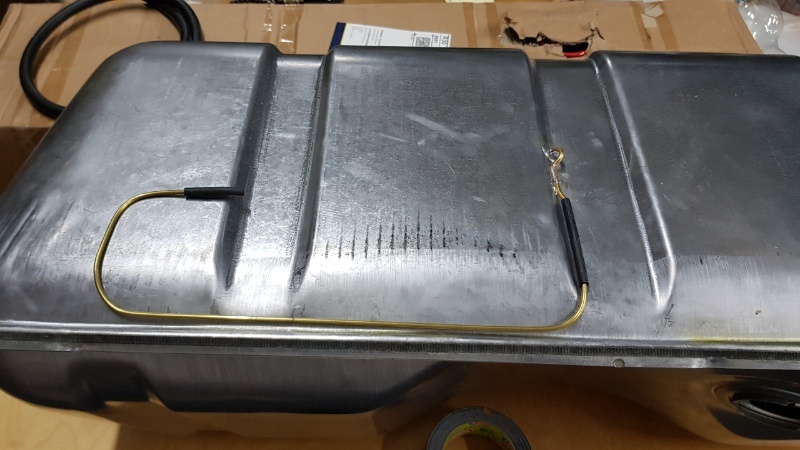 If we had a bit more neck room on the tank itself it'd be just easy to "fix" this with a piece of tube rated for gasoline (like in many other thousands of applications i.e. other brands and models). Btw, now reading your last phrase, perhaps the new vent design has taken care of that issue for good. Hopefully!! I will try to get Spectra's cents on it and talk to a few restores and performance guys and will write back! Great discussion so far!! Thanks everybody!! Amazing input!! Thanks Paul and Blab!! I will definitely build up something like this anyways. Welcome, new Ford guy. This thread and a couple others (via search) contain everything on tank replacement. Got pictures of the engine bay, whole car?